I’ve been keeping journals or writer’s notebooks since I was in high school. 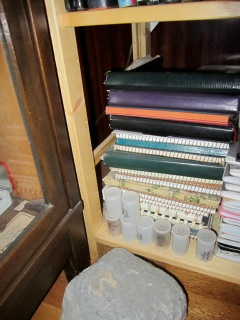 In this picture is a stack from recent years. The rest are in a box somewhere in the basement! My first notebooks were journals where I wrote about the trials and tribulations of being a teenager. Later, when I became a teacher and learned about writing workshop, my notebooks were partly a model of what I wanted my students' notebooks to be, and partly a place where I took notes at conferences and meetings It's embarrassing to admit, but my notebooks seldom did what they were supposed to do -- few pieces of writing were ever born in my notebook. Fast forward to Poetry Month 2010. I challenged myself to write a poem every day that April, and post it on our blog, A Year of Reading. In honor of this project, I bought a new red notebook - my first poetry notebook. That red volume lasted for two years worth of April Poetry Month poems. This past March, I took part in Ed DeCaria's Madness! 2012 and the four poems I wrote for that competition were all born in that red notebook. Here's a peek (below) at the early drafts of the poem that became Saffron Harvest. My early notes were about how the stigmas of crocus flowers are used to make saffron, but then I spent several pages trying to write a poem about pigs and several more pages trying to write a poem about dandelions! Five pages later, I got back to saffron, and the final poem started to take shape. 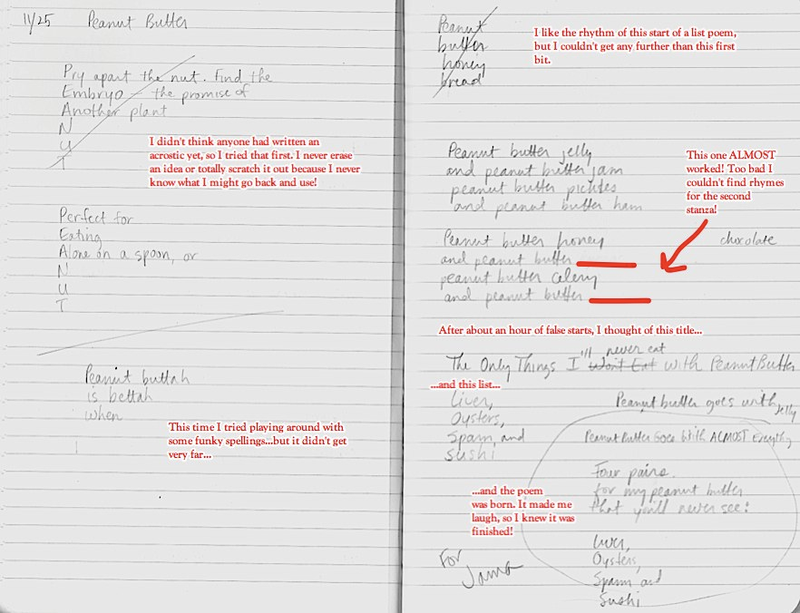 This year, something happened after Poetry Month was over: I KEPT WRITING POETRY! 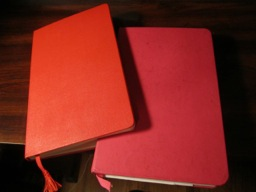 Now my poetry notebook is the pink one in the picture above. Last weekend, I decided (at the eleventh hour) to take part in Jama Rattigan's month-long celebration of peanut butter. Below, you can see the entire process for the poem I wrote. I won't need to start from scratch for my next poem. I have notes in my notebook about this week's full moon, about the frost on the grass a couple of weeks ago, and about truth, lies, facts, honesty , and self-discipline. The hardest thing about writing poetry isn't finding the ideas; it's making the time to follow an idea around and around, page after page, and for hour after hour until the poem is just right! Poet, blogger, and fifth grade teacher Mary Lee Hahn blogs at A Year of Reading where you can explore her poems, musings, wisdom, photographs, and book recommendations. She toasts writers' notebooks here! In honor of Mary Lee's notebook keeping, I would like to offer a giveaway of an ecosystem notebook, just like the pink one above (your choice of color). Please just leave a comment and a way to reach you, or check back at here on Saturday, December 15 to see if you have won. Thanks for having Mary Lee over, Amy! And Mary Lee, it's terrific to see how you've kept all those notebooks & how the process has evolved. I imagine that your students will love reading this, too, & seeing the birth of that Peanut Butter poem. Thank you for sharing! How fun! I'm sharing this post (and the comments) with my AM language arts class right now! What a wonderful way to start my Friday morning. Thank you Mary Lee for allowing us a glimpse of your notebooks. It will be fun to share this post with my 5th grade students on Poetry Friday!! Tell your student who was MY student last year that I said hello! Very proud of your persistence, Mary Lee! Those are great-looking notebooks -- very generous of you to have a giveaway, Amy! I would love to have a dedicated notebook for my poetry. Right now, I just have random notes scribbled all over the place! Love this peek into your journals, Mary Lee, and your process. "The hardest thing about writing poetry isn't finding the ideas; it's making the time to follow an idea around and around, page after page, and for hour after hour until the poem is just right!" - Ain't that the truth! Thanks for sharing, and thanks to Amy for these wonderful features. Your notebook is so neat! Ah...please remember that I got to CHOOSE the pages I showed you! I love these peeks into notebooks even if I do come away wishing I was more like all the people I read about here. Mary Lee, I love have one more piece of the puzzle that makes you so uniquely you. Your notebook persistence is inspiring. I have notebook ADD, bouncing from one notebook to another. I appreciate the inside peek into your process, and how you explore different forms and ideas on a single theme. I think the key to effectively using a writer's notebook, for me, was when I made the shift from a notebook where I gathered everything: journalling, meeting and conference notes, write-alongs with my students, etc, to having a notebook that is dedicated to the WRITING I intend to do: my poetry. That said, I still treasure all of those notebooks all the way back that contain everything AND the kitchen sink!! I tell my students every year to put their notebook in a safe place where they can make sure they keep it for 20-30 years so that when they look back, they'll have a glimpse of themselves at age 10! How nice it is that you have all your notebooks and journals. I only saved some of my high school ones and I treasure all that teen writing. I'm mad that I actually threw some away because back then I thought what I wrote was dumb or didn't matter. Ugh! What a fool I was! When it comes to writing, I say SAVE EVERYTHING! That's why I only draw a line through unused ideas (no erasing or scribbling out) -- who knows when I might come back and want those words! Thanks for the peek into Mary Lee's notebooks and writing life. Such inspiration in her dedication and persistence. For the next three weeks, my students and I will be working on our calendar project. I can't wait to share the wisdom from this post and many others. We will be "following ideas around and around, page after page" and month after month. Mary Lee, this line is perfect! You are both true mentors for writers of all ages. MANY THANKS! Just love this - and thank you for sharing this glimpse into the process - both the notebook as well as your notes on the thinking. Definitely have to share this with my sixth graders. I LOVE this!!! Thank you for sharing and I am determined to figure out to share this with my primary kiddos...I loved reading about your process ML. So glad to find this blog! This was great Mary Lee! I really loved that laughter was what tipped the scale for you and you knew the poem was complete. I may take a bit of your advice to heart and think about getting a separate notebook for the "intended" writing as you said in an earlier comment. Tried it once before, but seeing more of a need for it now. You are always so inspiring Mary Lee. It is always a treat to take a peek Amy, thanks for sharing with us once again. What fun to see your process, Mary Lee, and to watch you take the reins and run with your poetry-loving-and-writing self! Your left side page resembles many of my acrostic attempts, too! 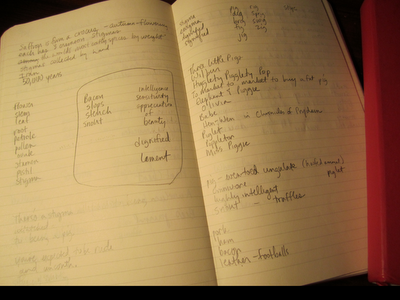 Btw, what program did you use to add the little red notes on your journal photo? The program is Skitch. Very fun, isn't it! Thanks for highlighting this fine writer and poetry passer! High praise, coming from you, Sir! THANKS! Loved this post!! 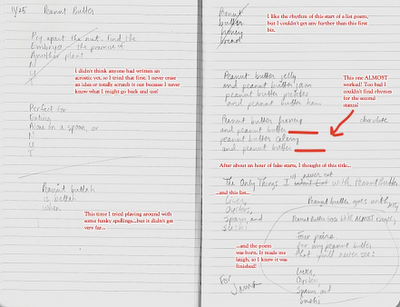 How refreshing to see someone else whose notebook contains a bunch of false starts and unfinished writing! This really makes me feel so much better about my notebook. I always carry guilt around with me when I don't finish something I started, or I give up after too many false starts! I'm not doing that anymore. Thanks, Mary Lee.